The Analyzer Script Editor is a straightforward user interface with a tree view on the left for easy navigation of features, and a content view on the right. Enter script or command to build the application. 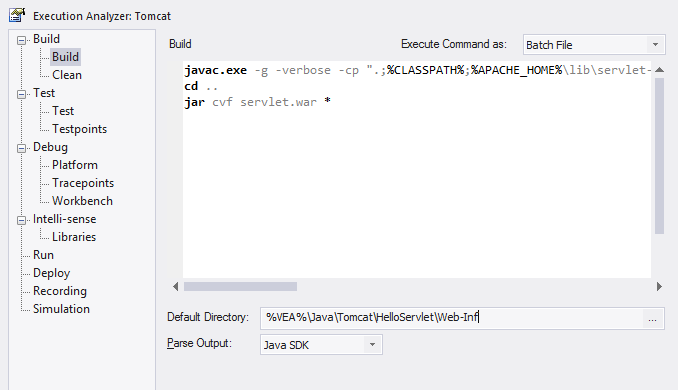 This can be an Apache Ant or Visual Studio command, but can also be tailored depending on your development environment. Note: Remember to select a parser to get directly to the source code in the event of any errors. The parser field is on the same page and offers support for many languages. Enter script or command to clean the previous build. This is the command line you would normally issue to build your system. This can be an Apache Ant or Visual Studio command depending on your development environment. Enter script or command to test the application. This is typically where an nUnit or jUnit invocation might be configured, but it just as easily could be any procedure or program. Specify the debugging platform, the application to be debugged, and the mode of debugging (attach to process or run). For .NET projects, the assembly to load. Not required for Java. Enter a script or command to deploy the project. Build your jar file. Deploy to your device, an emulator or Tomcat server. Publish a web site. Its up to you. Does your Sequence diagram look like the national grid? Reduce the clutter with filters. Filters define exclusion zones in your code base that can cut down dramatically on any 'noise' that is being recorded. Even accurate noise is not always helpful.